Common isotropic yield surfaces. 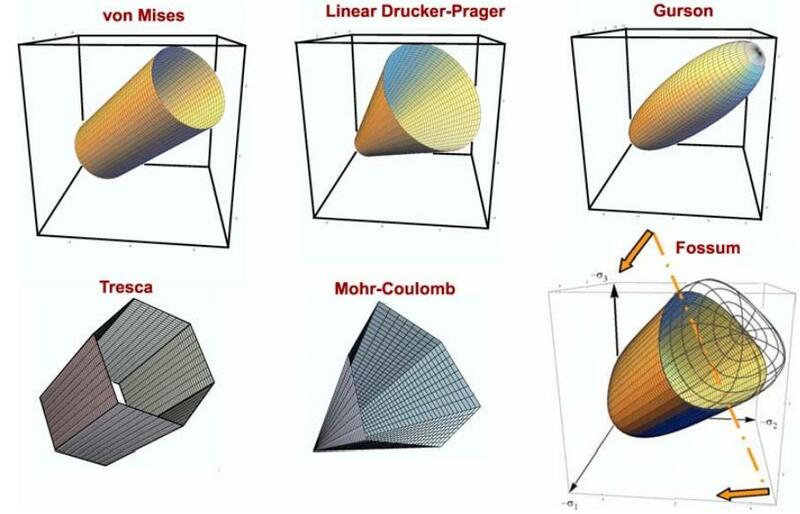 Von Mises and Drucker-Prager models are often used for metals. Gurson’s function, and others like it, are used for porous media. Tresca and Mohr-Coulomb models approximate the yield threshold for brittle media. Fossum’s model, and others like it, combine these features to model realistic geological media. This report investigates the validity of several key assumptions in classical plasticity theory regarding material response to changes in the loading direction. Three metals, two rock types, and one ceramic were subjected to non-standard loading directions, and the resulting strain response increments were displayed in Gudehus diagrams to illustrate the approximation error of classical plasticity theories. A rigorous mathematical framework for ﬁtting classical theories to the data,thus quantifying the error, is provided. Further data analysis techniques are presented that allow testing for the effect of changes in loading direction without having to use a new sample and for inferring the yield normal and ﬂow directions without having to measure the yield surface. Though the data are inconclusive, there is indication that classical, incrementally linear, plasticity theory may be inadequate over a certain range of loading directions. This range of loading directions also coincides with loading directions that are known to produce a physically inadmissible instability for any nonassociative plasticity model. This entry was posted in Abstracts, Projects, Publications, Research and tagged Drucker-Prager, experiment, material, metal, models, plastic, plasticity, rock, strain. Bookmark the permalink.